In anticipation of their upcoming Perspective 2019 meeting at ASCRS/ASOA in San Diego, CA, the Outpatient Ophthalmic Surgery Society (OOSS) has recently launched the Experience OOSS app. The Outpatient Ophthalmic Surgery Society is the only organization dedicated exclusively to the ophthalmic-driven ASC. We work to ensure top-quality patient care and safety in an environment of ever-changing technology and regulation. To this end, we support continuing education and research and represent the ophthalmic ASC industry before Congress and regulatory agencies in Washington, D.C. We strive to ensure that all ophthalmic services are eligible for Medicare facility reimbursement, that industry regulations are well-informed and effective, and that facility fees are reasonable and equitable. 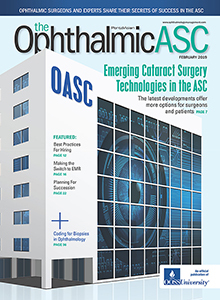 Biweekly email updates consolidating the latest, most relevant stories, events, and topics of discussion circulating OOSS and the ophthalmic ASC community. Delivered every other Tuesday. Access the full array of resources and tools offered through your Outpatient Ophthalmic Surgery Society membership.